One would think that today's paperless office would yield excess space in your file cabinets and office storage cabinets. Not so, in your office? 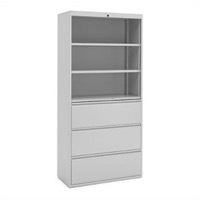 Then, you have come to the right place to purchase discount file cabinets and office storage cabinets. If you need additional file cabinet space we have a huge selection of mobile file cabinets and lateral filing cabinets to choose from in a wide variety of finishes. Many of the file cabinets and office storage cabinets we offer match our Mayline office furniture collections. We have highlighted a few of our featured selections in the pictures shown below. You can view our complete selection of file cabinets and office storage cabinets in the listings below these featured selections! Inspired by the Louis-Philippe design, Rue de Lyon expertly blends old world styling and modern functionality. The collection is crafted from maple solids, select hardwoods and American cherry veneers on select wood products finished in a rich chocolate patina. A nice durable piece of office furniture for every home or business need. Protect your CPU from damaging environmental factors by keeping it off the floor and out of the way with one of our CPU holders. Protect your CPU from damaging environmental factors by keeping it off the floor and out of the way with one of our CPU holders. Protect your CPU from damaging environmental factors by keeping it off the floor and out of the way with one of our CPU holders. Protect your CPU from damaging environmental factors by keeping it off the floor and out of the way with one of our CPU holders. Double door cabinets are are available in four heights and three widths. The 5-high cabinet may also be ordered with a side-to-side coat rod instead of shelves. Concealed hinges are self-closing and allow for 110 degree opening. Double door cabinets are are available in four heights and three widths. The 5-high cabinet may also be ordered with a side-to-side coat rod instead of shelves. Concealed hinges are self-closing and allow for 110 degree opening. Double door cabinets are are available in four heights and three widths. The 5-high cabinet may also be ordered with a side-to-side coat rod instead of shelves. Concealed hinges are self-closing and allow for 110 degree opening. Double door cabinets are available in four heights and three widths. The 5-high cabinet may also be ordered with a side-to-side coat rod instead of shelves. Concealed hinges are self-closing and allow for 110 degree opening. Double door cabinets are available in four heights and three widths. The 5-high cabinet may also be ordered with a side-to-side coat rod instead of shelves. Concealed hinges are self-closing and allow for 110 degree opening. Double door cabinets are 36” wide, and are available in 4 heights. The 5-high cabinet may also be ordered with a side-to-side coat rod instead of shelves. Nickel-plated, concealed hinges are self-closing and allow for 110 degree opening. Double door cabinets are available in four heights and three widths. The 5-high cabinet may also be ordered with a side-to-side coat rod instead of shelves. Concealed hinges are self-closing and allow for 110 degree opening. Double door cabinets are available in four heights and three widths. The 5-high cabinet may also be ordered with a side-to-side coat rod instead of shelves. Concealed hinges are self-closing and allow for 110 degree opening. When you need to keep your office in order the easiest solution is to invest in a filing cabinet! The Great Openings standard lateral file cabinet features 2 drawers with ample space that accommodates letter, A4, and legal files. When you need to keep your office in order the easiest solution is to invest in a filing cabinet! The Great Openings standard lateral file cabinet features 2 drawers with ample space that accommodates letter, A4, and legal files. When you need to keep your office in order the easiest solution is to invest in a filing cabinet! The Great Openings standard lateral file cabinet features 2 drawers with ample space that accommodates letter, A4, and legal files. When you need to keep your office in order the easiest solution is to invest in a filing cabinet! The Great Openings standard lateral file cabinet features 3 drawers with ample space that accommodates letter, A4, and legal files. When you need to keep your office in order the easiest solution is to invest in a filing cabinet! The Great Openings standard lateral file cabinet features 3 drawers with ample space that accommodates letter, A4, and legal files. When you need to keep your office in order the easiest solution is to invest in a filing cabinet! The Great Openings standard lateral file cabinet features 3 drawers with ample space that accommodates letter, A4, and legal files. When you need to keep your office in order the easiest solution is to invest in a filing cabinet! The Great Openings standard lateral file cabinet features 4 drawers with ample space that accommodates letter, A4, and legal files. When you need to keep your office in order the easiest solution is to invest in a filing cabinet! The Great Openings standard lateral file cabinet features 4 drawers with ample space that accommodates letter, A4, and legal files. When you need to keep your office in order the easiest solution is to invest in a filing cabinet! The Great Openings standard lateral file cabinet features 4 drawers with ample space that accommodates letter, A4, and legal files. When you need to keep your office in order the easiest solution is to invest in a filing cabinet! The Great Openings standard lateral file cabinet features 5 drawers with ample space that accommodates letter, A4, and legal files. When you need to keep your office in order the easiest solution is to invest in a filing cabinet! The Great Openings standard lateral file cabinet features 5 drawers with ample space that accommodates letter, A4, and legal files. When you need to keep your office in order the easiest solution is to invest in a filing cabinet! The Great Openings standard lateral file cabinet features 5 drawers with ample space that accommodates letter, A4, and legal files. When you need to keep your office in order the easiest solution is to invest in a filing cabinet! The Great Openings standard lateral file cabinet features 6 drawers with ample space that accommodates letter, A4, and legal files. When you need to keep your office in order the easiest solution is to invest in a filing cabinet! The Great Openings standard lateral file cabinet features 6 drawers with ample space that accommodates letter, A4, and legal files. When you need to keep your office in order the easiest solution is to invest in a filing cabinet! The Great Openings standard lateral file cabinet features 6 drawers with ample space that accommodates letter, A4, and legal files. When you need to keep your office in order the easiest solution is to invest in a filing cabinet! The Great Openings standard lateral file cabinet features two drawers with ample space that accommodates letter, A4, and legal files. When you need to keep your office in order the easiest solution is to invest in a filing cabinet! The Great Openings standard lateral file cabinet features two drawers with ample space that accommodates letter, A4, and legal files. When you need to keep your office in order the easiest solution is to invest in a filing cabinet! The Great Openings standard lateral file cabinet features muliple drawers with ample space that accommodates letter, A4, and legal files. When you need to keep your office in order the easiest solution is to invest in a filing cabinet! The Great Openings standard lateral file cabinet features muliple drawers with ample space that accommodates letter, A4, and legal files. When you need to keep your office in order the easiest solution is to invest in a filing cabinet! The Great Openings standard lateral file cabinet features muliple drawers with ample space that accommodates letter, A4, and legal files. When you need to keep your office in order the easiest solution is to invest in a filing cabinet! The Great Openings standard lateral file cabinet features two drawers with ample space that accommodates letter, A4, and legal files. When you need to keep your office in order the easiest solution is to invest in a filing cabinet! The Great Openings standard lateral file cabinet features 2drawers with ample space that accommodates letter, A4, and legal files. When you need to keep your office in order the easiest solution is to invest in a filing cabinet! The Great Openings standard lateral file cabinet features 2drawers with ample space that accommodates letter, A4, and legal files. When you need to keep your office in order the easiest solution is to invest in a filing cabinet! The Great Openings standard lateral file cabinet features 2drawers with ample space that accommodates letter, A4, and legal files. When you need to keep your office in order the easiest solution is to invest in a filing cabinet! The Great Openings standard lateral file cabinet features two drawers with ample space that accommodates letter, A4, and legal files. The Brighton discount office furniture provides balance and beauty to any office setting with simple, yet functional design details for office desks, conference tables, and office storage cabinets that create a transitional style to meet the needs of today's fast paced business environment. 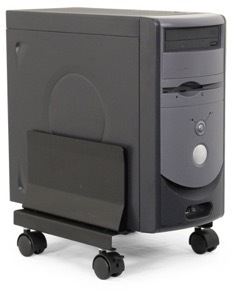 The High Wire Cart is a multi-purpose cart for small machines, projectors, etc. Slide-out wire basket, steel posting shelf and three additional shelves along with adjustable flip-up shelf. Mobile on 4 casters, 2 locking. 125 lb. load capacity. 2140CA has steel construction, thermafoil top and a 29"W x 14"D shelf. Provides 11 1/2"H opening. Square tubing legs with dual wheel casters, two with locks and a 200# weight capacity. The Mobile Utility Cabinets top surface is large enough for copiers, fax machines or coffee machines 25 1/2" wide x 20" deep. All with low-pressure laminate sides, doors and top. Steel back, shelf and bottom. Interior shelf adjusts in height in four positions in 2" increments. Hinged doors provide 110 degree swing. 150# weight capacity. Mobile Utility Cabinets have all steel cabinets with low-pressure laminate top and roll formed steel doors. Casters for mobility (2 locking). Does not include interior middle shelf. 150# weight capacity. The Mayline CSII discount office furniture - Durable all steel desks at exceptional prices. From mobile computer workstations to executive desks, and meeting tables, The Mayline Group's focus has always been on innovative office furniture. With stylish designs to complement any decor, Mayline and Tiffany Industries feature durable steel office furniture at exceptional prices. The Mayline CSII discount office furniture - Durable all steel desks at exceptional prices. From mobile computer workstations to executive desks, and meeting tables, The Mayline Group's focus has always been on innovative office furniture. With stylish designs to complement any decor, Mayline and Tiffany Industries feature durable steel office furniture at exceptional prices. The Mayline CSII discount office furniture - Durable all steel desks at exceptional prices. From mobile computer workstations to executive desks, and meeting tables, The Mayline Group's focus has always been on innovative office furniture. With stylish designs to complement any decor, Mayline and Tiffany Industries feature durable steel office furniture at exceptional prices. Pedestals have an attractive thermofoil surface treatments on drawer fronts and tops match workstations. Sides feature perforated steel and ball-bearing suspensions for quiet, smooth drawer operation. Mobile on 5 casters, 2 locking. Eastwinds computer furniture is designed for the technology-driven office and adaptable to a variety of environments. The Mira Series Pedestal Files for Credenza/Return and 30"D Desks have drawer interiors that are finished to match the exterior veneer. The drawers operate smoothly using full-extension ball-bearing suspensions. The Gang-lock features a removable core. There is a choice of two styles featuring two file drawers or two box drawers and one file drawer. The file drawers accommodate letter or legal size hanging file folders. The Mira Series Pedestal Files for Credenza/Return and 30"D Desks have drawer interiors that are finished to match the exterior veneer. The drawers operate smoothly using full-extension ball-bearing suspensions. The Gang-lock features a removable core. There is a choice of two styles featuring two file drawers or two box drawers and one file drawer. The file drawers accommodate letter or legal size hanging file folders. The Mira Series Pedestal Files for Desk-36" have drawer interiors that are finished to match the exterior veneer. The drawers operate smoothly using full-extension ball-bearing suspensions. The Gang-lock features a removable core. There is a choice of two styles featuring two file drawers or two box drawers and one file drawer. The file drawers accommodate letter or legal size hanging file folders. 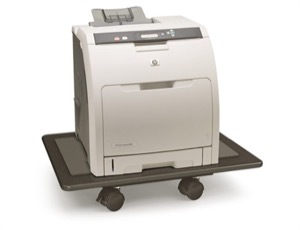 It is designed for use under a 36" desk or return. The Mira Series Pedestal Files for Desk-36" have drawer interiors that are finished to match the exterior veneer. The drawers operate smoothly using full-extension ball-bearing suspensions. The Gang-lock features a removable core. There is a choice of two styles featuring two file drawers or two box drawers and one file drawer. The file drawers accommodate letter or legal size hanging file folders. 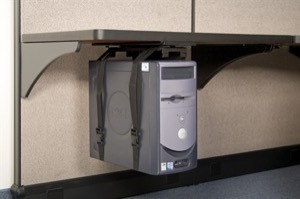 It is designed for use under a 36" desk or return. The Mira Series Credenza has a full-height modesty panel and a reeded edge matching desk detailing. The Mira Series Hinged Door Credenza has an interior finished to match exterior veneer. The Gang-lock features a removable core enabling keyed-alike suites. There is one adjustable shelf. The Mayline MIRA office furniture collection includes office storage cabinets feature wood veneer work surfaces, hardwood detail for style, and a catalyzed lacquer finish to protect and highlight the natural wood grain. This MIRA discount office furniture will make a quality statement to your clients and associates. The Mira Series Hinged Door Credenza has an interior finished to match exterior veneer. The Gang-lock features a removable core enabling keyed-alike suites. There is one adjustable shelf. The Mira Series Freestanding Lateral File-2 Drawer has a Gang-lock that features removable core enabling keyed-alike suites. The drawers operate smoothly using full-extension ball-bearing suspensions. 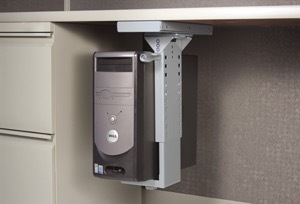 It supports a wardrobe unit and accommodates letter and legal size hanging file folders. It includes a counter-weight for stability when in use. The Corsica Lateral File drawer interiors finished to match exterior veneer. The Gang-lock features removable core enabling keyed-alike suites. The drawers operate smoothly using full-extension ball-bearing suspensions. It includes counter-weight for stability when in use. It accommodates letter and legal sized hanging file folders. The Napoli Series Low wall Cabinet with Doors features a choice of all wood/glass, all-wood, or all-glass door sets. The sets of doors lock separately, and are keyed alike. It includes one adjustable shelf on each side. The Corsica Series Low Wall Cabinet with Doors features a choice of wood/glass, all-wood, or all-glass door sets. The sets of doors lock separately, but are keyed alike. It includes one adjustable shelf on each side. The Corsica Series Low Wall Cabinet with Doors features a choice of wood/glass, all-wood, or all-glass door sets. The sets of doors lock separately, but are keyed alike. It includes one adjustable shelf on each side. The Napoli veneer desk system features Italian-influenced, sophisticated styling for business or home office. Napoli discount office furniture combines clean, modern lines with stylish accents and a wide selection of office desks, conference tables, and storage cabinets. The Napoli veneer desk system features Italian-influenced, sophisticated styling for business or home office. Napoli discount office furniture combines clean, modern lines with stylish accents and a wide selection of office desks, conference tables, and storage cabinets. The Corsica Series Buffet features two cabinet compartments (one adjustable shelf in each) and four drawers. 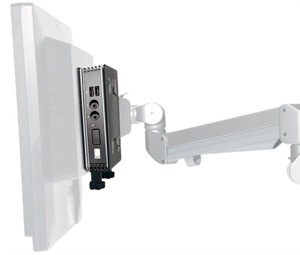 It is designed for audio/visual support including cable pass throughs and an inset back panel for wall plug clearance. All drawer and cabinet interiors are full-finished veneer. The Corsica Series Combo File has drawer interiors finished to match the exterior veneer. The drawers operate smoothly using full-extension ball-bearing suspensions. The file drawers accommodate letter and legal sized hanging file folders. The Corsica Series High Wall Cabinet with Doors features glass doors with a silver frame above wood doors. The top and bottom doors lock separately, but are keyed alike. It includes two adjustable shelves in the top section and one adjustable shelf in the lower section. It is able to stand alone or be flanked by Wardrobe Cabinets. The Sorrento Series Storage Options have a Low Wall Cabinet that has one internal shelf in each compartment that adjusts to 5 different positions on 1 1/4" increments. Does not lock. The Executive Buffet Cabinet has one internal shelf in each compartment that adjusts to 3 positions and 2 1/2"H increments. It does not lock. The Lateral files feature an interlock system allowing only one drawer to open at a time. A Standard gang lock is provided. SLC and SBUF have wood doors (Bourbon Cherry) or frosted glass doors (Espresso). SBQ5 and SB5 have 1" thick shelves. The Sorrento Series Lateral Files feature an interlock system allowing only one drawer to open at a time. There is a standard gang lock provided. The Toscana Series Low Wall Cabinet has one internal shelf in each compartment that adjusts to 5 positions on 1 1/4"H increments. It does not lock. The OFM office furniture features modern styling for your office, utility room, or meeting area. The OFM office furniture combines clean, modern lines with stylish accents and a wide selection of tables, desks, and chairs. The OFM office furniture features modern styling for your office, utility room, or meeting area. The OFM office furniture combines clean, modern lines with stylish accents and a wide selection of tables, desks, and chairs. The Prestige office furniture provides balance and beauty to any office setting with classic, yet functional design details for office desks, conference tables, and office storage cabinets that create a transitional style to meet the needs of today's fast paced business environment. Save up to 70% on Office Storage Cabinets, lateral file cabinets, mobile file cabinets, and office furniture. As an added benefit you receive FREE SHIPPING on all of our office file cabinets.